I was sent this quote via Facebook this morning, from a new acquaintance, a friend-of-a-friend. I couldn't help but feel it had meaning for me. Now realistically, I'm not about to change the world, but I do hope that things I do in my lifetime, will make a difference. Like the awareness I raise of Cancer, and also of pre-eclampsia and HELLP Syndrome. Give advice on twin-issues, get people expressing themselves through poetry and maybe just occasionally, make people laugh! I DO think I can make a difference to Cancer Research with my #EmmasArmy Campaign, which already, has 35 recruits signed up! If you want to help me make a difference - you can sign up too - either to promote the event or to take part in it. You can sponsor #EmmasArmy too. And if you are a brand reading this, you also, could sponsor - just get in touch on the sign-up form! If you have a quote, lyric, poem, prose, short story or letter, you'd like to link up to #WednesdayWords - Just grab the badge below, put it on your blog, link up your post below and MAKE SURE YOU COMMENT ON SOME OTHER ENTRIES! It's what makes this linky work! Thanking you muchly! 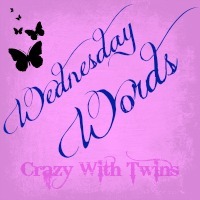 This entry was posted in Blog Hops / Memes / Linkies, Blogging, Cancer, Charity / Awareness, Radioactive mum, Uncategorized, Wednesday Words and tagged #EmmasArmy, #WednesdayWords, blogger linky, Cancer, Cancer Research UK, crazy enough to change the world, Crazy with twins, crazywithtwins, Emma's Army, letters, literature linky, lyrics, Poetry, prose, quotes, short stories, Steve Jobs, Wednesday words. Bookmark the permalink. Carolynne – Mummy Endeavours recently posted..Is Your Child Too Young for School?